This client needed a series of sketches for their contractor to follow in order to assure a good result. As we worked on the drawings, I realized that a model would better serve the project, so I produced this design in three dimensions. I'm often called in for jobs like this where my drawings and plans help bridge the all-too-often broad gap between what a client envisions and what their contractor gives them. 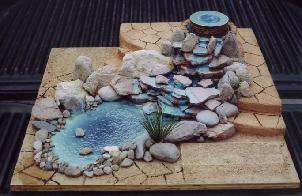 Fountain design. Natural stone, stucco, acrylic.